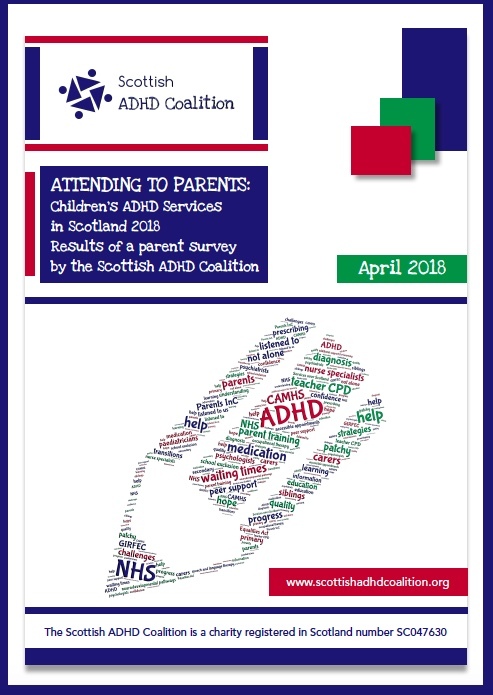 April 17th 2018 saw the publication of the results of our survey of parents about health and education services for children with ADHD across Scotland. The survey was answered by more than 200 parents of children with a confirmed diagnosis of ADHD across Scotland and paints a picture of health and education services which are excellent at best, but not consistent enough. Many health services are overly focused on medication provision as the only treatment on offer for ADHD, and teachers urgently need more training on AD. The report also highlights the huge value that peer support groups, including Coalition members, bring in supporting parents to feel less alone. Waiting times for CAMHS teams are unacceptably long in some areas and this is a barrier to timely assessment and review of children with ADHD. They need to be reduced. Parent training tailored to the needs of parents of children with ADHD should be offered to all families at diagnosis. Programmes such as NHS Fife’s Pinc© for parents of primary school children and Young People In Control (YPinc)©, which recognises the changing needs of adolescents, should be available for all families. The availability of written information offered to parents and children about ADHD needs to be improved. Children need information tailored to their age group. As children mature and reach adolescence, it is particularly important that they are supported to find out about ADHD for themselves and begin to take responsibility for managing their own condition. Current treatment for ADHD is very medication-focused. Whilst our survey could not assess unmet need, there is a case for greater multi-disciplinary team support, involving not only ADHD nurses and psychiatrists but also psychologists, occupational therapists, speech and language therapists and dieticians for children with more complex needs. Families who do not at first accept the offer of medication should not be discharged from the service if they still have needs. ADHD cannot be seen in isolation. There is a need for more joined-up neurodevelopmental care pathways where children can be assessed for related difficulties such as ASD and sensory issues alongside ADHD, and holistic treatment plans can be put in place. CAMHS teams need to be more proactive in reaching out to education services, and not only as part of the assessment process. After diagnosis, CAMHS should be working with schools to ensure they understand the diagnosis and make and implement appropriate plans, and jointly to monitor the effectiveness of both health and educational interventions. Additional support plans for children with ADHD need to be made and, crucially, consistently implemented by schools. This includes clear communication between teaching staff and between schools and parents. Teachers need more training about ADHD, both in order to recognise signs and symptoms and refer children for assessment and also to manage children with ADHD in the classroom. There should be a systematic programme of continuing professional development about ADHD and related disorders, as well as online resources available as needed to support teachers. Mainstream education may be an unrealistic goal for some children with ADHD and more complex needs. Where needed and appropriate, specialist provision should be available.